Tankers (tenders), especially those carrying very large amounts of water, have sometimes been criticized for two major drawbacks: sacrificing compartment space to get to a specified gallonage and having heavy and less responsive handling capabilities. But such worries have been taken out of the picture with the introduction of KME’s Eliminator™ tanker. KME Eliminator tankers are designed to carry a large amount of water while exhibiting unmatched handling capabilities and still give fire departments plenty of hose storage space and ample compartment options. KME’s Eliminator body allows for hundreds of compartment configurations, ranging from simple low side compartments to full height/split depth compartments for pumper-tanker configurations. The Eliminator’s pump panel has an angled gauge panel that gives an operator an improved view of the control from the standard operating position while still keeping the pump panel width as tight as possible, even when packaged with a 1,500-gallon-per minute (gpm) rated pump and lowered single stack crosslays. “The biggest innovation with the Eliminator is putting a 2,500-gallon UPF polypropylene tank on a 33,500-pound-rated single axle commercial chassis that allows for optimal weight distribution and makes the vehicle much easier to handle,” Kopunek points out. KME recently built an Eliminator pumper-tanker for the West Chester (SC) Fire Department on an International 4400 two-door single rear axle chassis with a Hale DSD 1,250-gpm single-stage pump, a 2,000-gallon UPF water tank, a rear 10-inch Newton swivel dump, a portable water tank rack on the driver’s side, and a standard pumper complement of ladders and two 10-foot hard suction hoses on the officer’s side rack with both racks being electrically operated Zico models. For the Owasco (NY) Fire Department, KME built an Eliminator pumper-tanker on a custom Panther chassis with a single rear axle carrying a Hale DSD 1,500-gpm single-stage pump and a 2,000-gallon UPF water tank powered by a 450-horsepower Cummins ISL9 diesel engine and an Allison 3000 EVS automatic transmission. Eliminator tankers also can be built on dual rear axle vehicles and carry water tanks up to 4,000 gallons in size. 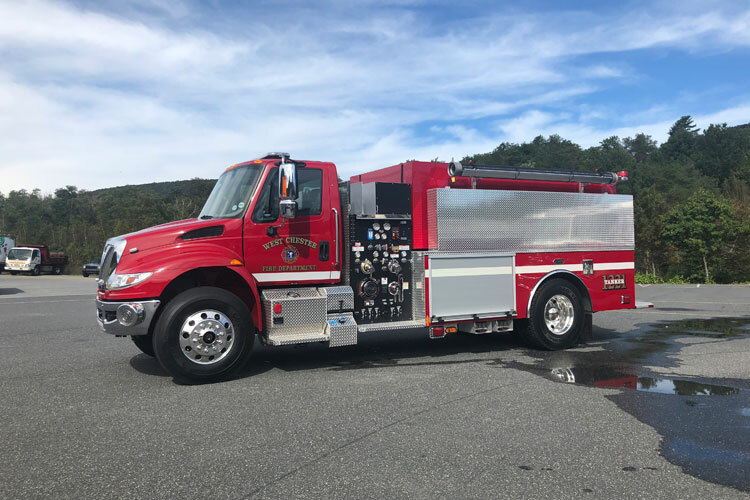 KME recently completed a pumper-tanker demo unit on a Freightliner M2-112 two-door chassis with a dual rear axle that carries a Hale DSD 1,500-gpm single-stage pump and a 3,000-gallon UPF water tank with three Newton 10-inch electric dump chutes–one at the rear and one on each side over the rear axles.